Every house has a different zone used for different purpose. One of the important areas in any home is a zone of tranquility which is known as a temple or pooja room. According to vastu, this zone is best suitable for pooja (prayer) room or home temple. This is a place that brings us closer to our Creator. It can be considered lifting one’s mind and heart to God. Here we can talk to God about the everyday things of human life, about our joys and sorrows, our needs and wants, our disappointments and pleasures. Prayer and how an individual prays is often shaped by religious beliefs. But one does not have to belong to a specific religion to pray. According to Vishwakarma Prakash Chapter -2, Sloka 94, puja room should be in the northeast corner. Best time for the prayer can be during early morning or evening, a thank you for a good day, for the warmth of the sun, for love of friends who support and assist us even on our bad or difficult days. This is a space where human-made problems are left behind like a wet umbrella at the door. Set a small altar on the east wall of the North-east zone, if you do not have the space to allocate an entire room for pooja. Images or idols of Deity or god should be positioned in such a way that devotee faces east while making a prayer. West is another alternate location for the prayer area. Do not put too many idols of deities in the temple. Immerse the rest in flowing water. Place marble or copper pot containing water at the northeast direction of the temple. Change this water daily. You can also place a water pyramid near the temple for enhancing the water element of the north-east zone. Place light or Diya in the south-east corner of the pooja room. Do not keep photographs (pictures) of the dead/ancestors in the prayer zone. Keep this area neat, clean and also, clutter-free. Space of worship should be invoked simplicity and cleanliness. This room or zone should be strictly used for the prayer and meditation purpose only. Due to the shortage of space, some people keep the temple in a bedroom or kitchen. Keep a small curtain in the front while not using a prayer room. Do not overcrowd your prayer room. Stick to necessity only to keep this space sacred. Temple should not share the wall having a toilet on the other side (behind it). Temple should not be placed below a toilet located on the upper floor. Do not place pooja room and toilet facing each other. 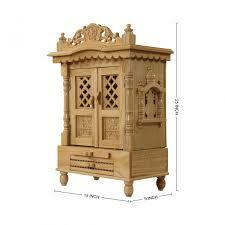 Make a temple made of wood or marble. Avoid temple made in glass or wood. Design of the temple should be inviting and very attractive. It is auspicious to keep Crystal Kalash, right-hand Shankh, Shree Yantra or Crystal Shankha in the prayer room. Invite entire family to check out this space on a daily basis. Use colors of tranquility like white, orange or silver which enhance the space for meditation. These colors are uplifting and energizing. You need to take time out of your day to reflect, meditate, and pray. Even spending a few minutes in prayer zone will bring inner strength to carry you through the high and low in your life. Like home, there should also be a prayer space in offices, factories, schools, hospitals and, also hotels. At prayer room, our burden becomes lighter, and we can be touched by hands of spirit. Honor your tranquil zone by making your presence there regularly. Arranging home worship area in a correct way helps you to derive maximum spiritual benefits to the entire family. Do not ignore the importance of prayer zone. Redo your prayer corner if not in a good shape.